One year ago today, I was on the road, driving north from spending Thanksgiving in San Diego with family. We traveled down primarily to see my grandmother who we knew would not be with us much longer. On Thanksgiving Day I awoke to an exciting email that my very first design had been accepted to be published in a magazine. But later that day I went to see my grandmother for what I knew would be the last time. As we travelled north the day after Thanksgiving, I began experimenting to see what stitch would work best for the design I had in mind. We made a couple stops to visit family and friends in Los Angeles. During the last stop, I received the call that my grandmother had passed away. Throughout the rest of our three day journey, I thought about my grandmother and crocheted reversible intarsia hearts. I made them in single , half double , and double crochet. I tried them upright and at an angle. I finally settled on half double crochet as it created the smoothest lines, and at an angle so that beginners would only have to worry about one bobbin for the entire heart. 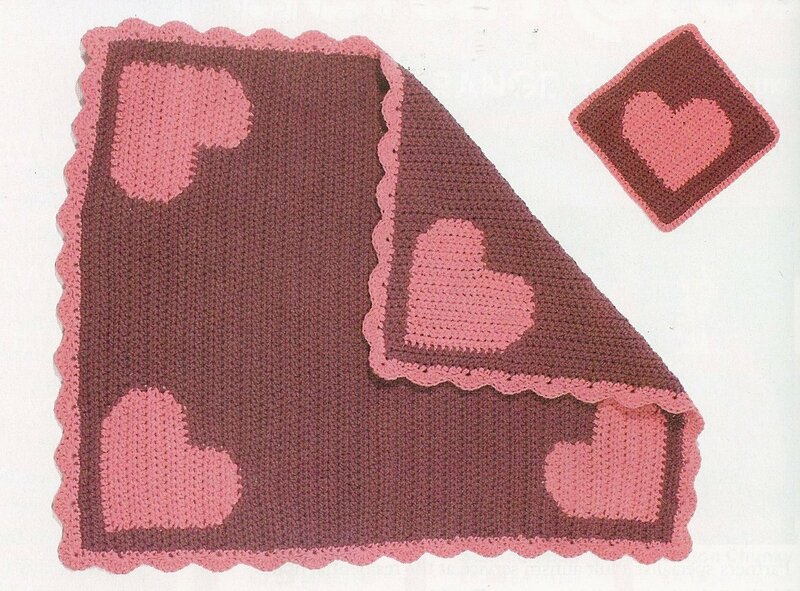 Although these hearts became a baby blanket, as I wanted a small project to introduce a "new-to-just-about-everyone technique", I really designed them for my grandmother. She was a marvelous woman who touched so many lives, and even self published her own book. I hope she would be proud to know that my first published pattern was designed with her in mind, and that I also self published my first book.